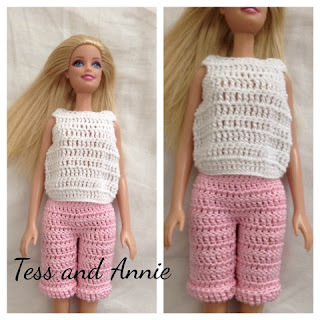 Here is the pattern for Barbie's play outfit! Row 1: With white, ch 64, tr in 5th st from hook, 1 tr in each of the next 4 sts, 1 dc in each of the next 5 sts, 1 hdc in each of the next 5 sts, 1 sc in each of the next 5 sts, 1 tr in each of the next 20 sts, 1 sc in each of the next 5 sts, 1 hdc in each of the next 5 sts, 1 dc in each of the next 5 sts, 1 tr in each of the last 5 sts, turn. Rows 2-8: Ch 4, 1 tr in each st across, turn. Row 9: Ch 4, 1 tr in each of the next 15 sts, ch 7, skip next 7 sts, tr in next st, 1 tr in each of the next 15 sts, ch 7, skip next 7 sts, tr in next st, 1 tr in each of the last 15 sts, turn. Row 11: Ch 1, (sc dec) across. Fasten off. Row 1: Ch 49, dc in 4th ch from hook, 1 dc in each ch across, turn. Row 2: Ch 3, 1 dc in each st across, turn. Rnds 3-6: Ch 3, 1 dc in each st around, join, turn. Rnd 7: Ch 3, 1 dc in each of the next 23 sts, join to 1st dc, turn, leaving remaining sts unworked. Rnds 8-14: Ch 3, 1 dc in each st around, join, turn. Rnd 15: Ch 4, IN BACK LOOPS ONLY, 1 tr in each st around, join fasten off. Fold last row up and add a few stitches to keep secure. Repeat rnds 7-15 for other leg. Weave in all ends.